A precise definition of the target population is essential and usually done in terms of 'elements', 'sampling units' and 'sampling frame'. An element is defined as a person or object from which data is sought and about which inferences are to be made. For example, target population elements for the washing machine study might include a particular brand (i.e. Brand X); specific group of people (i.e. females). Sampling units are the target population elements available for selection during the sampling process. Using the washing machine example, a sampling unit may be females who have purchased new washing machines rather than a second hand one. Choice of elements and sampling units may redefine the study. In case of washing machine it may now change from 'customer satisfaction among washing machine owners' to 'customer satisfaction among new brand X washing machine owner females'. The above example gives a brief overview of selecting target population, elements and sampling unit. However, in real life, deciding a target population is a highly complex task46 as many other variables are involved. A sampling frame is a representation of the elements of the target population. It consists of a list or set of directions for identifying the target population. Some common sources of sampling frame are lists of voters, commercial directories, telephone directories, or even maps. Many commercial organizations provide a database consisting of names, addresses, and telephone numbers of potential sampling frame for various studies. Regardless of the sources, it is very difficult and expensive to obtain truly accurate or representative sampling frames.47 For example, it will not be easy to obtain the addresses and names of new washing machine owners. However, in comparison it will be very difficult if the study was focused on second hand washing machine owners. Such difficulties in obtaining an accurate sampling frame leads to 'sampling frame error'. It can be defined as the variation between the population defined by the researcher and the population used. For example, telephone directories can be a source for such errors as it does not provide unlisted numbers or numbers which are obtained after the publication dates. At the same time it does provide numbers which might be cancelled or disconnected. Throughout the research process a researcher can make errors in judgement that results in creating some type of bias. 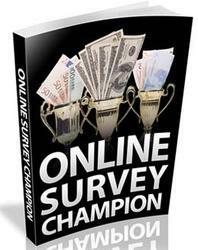 All such types of errors are classified in marketing research as sampling or nonsampling errors. Sampling errors represent any type of bias that is attributable to mistakes in either drawing a sample or demining the sample size. This leads to the sample being non-representative to the population and is at times called random sampling error also. Nonsampling errors represent a bias that occurs regardless of sample or census being used. Nonsampling errors can be categories as nonresponse error (respondent is unable or unwilling to respond) or response errors (inaccurate, misreported or misanalysed response). Determining sample size is a complex task and involves much clarity with regard to the balance between the resources available and number or accuracy or information obtained. Since data collection is generally one of the most expansive components of any research project various factors play a crucial role in determining the final sample size. Several qualitative and quantitative factors are considered when determining the sample size. The qualitative issues considered may include factors such as: (a) nature of research and expected outcome; (b) importance of the decision to organization; (c) number of variables being studied; (d) sample size in similar studies; (e) nature of analysis and (f) resource constraints. Various quantitative measures are also considered when determining sample size such as: (a) variability of the population characteristics (greater the variability, larger the sample required); (b) level of confidence desired (higher the confidence desired, larger the sample required); and (c) degree of precision desired in estimating population characteristics (more precise the study, larger the sample required). The size of sample also depends on the type of study that is being undertaken. Problem identification research (as defined in chapter 1) may require a sample of 1000 in comparison to problem solving research in the range of 300-500. How to obtain a sample is an important issue relating to research design. There are two basic sampling designs: probability and nonprobability sampling design. Of these two techniques, probability sampling is more robust in comparison as in this technique each sampling unit has a known, nonzero chance of getting selected in the final sample. Nonprobability techniques on the other hand, do not use chance selection procedure. Rather, they rely on the personal judgement of the researcher. The results obtained by using probability sampling can be generalized to the target population within a specified margin of error through the use of statistical methods. Put simply, probability sampling allows researchers to judge the reliability and validity of the findings in comparison to the defined target population. In case of nonprobability sampling, the selection of each sampling unit is unknown and therefore, the potential error between the sample and target population cannot be computed. Thus, generalizability of findings generated through nonprobability sampling is limited. While probability sampling techniques are robust in comparison one of the major disadvantages of such techniques is the difficulty in obtaining a complete, current and accurate listing of target population elements. Both probability and nonprobability sampling procedures can be further sub-divided into specific sampling techniques that are appropriate for different circumstances. 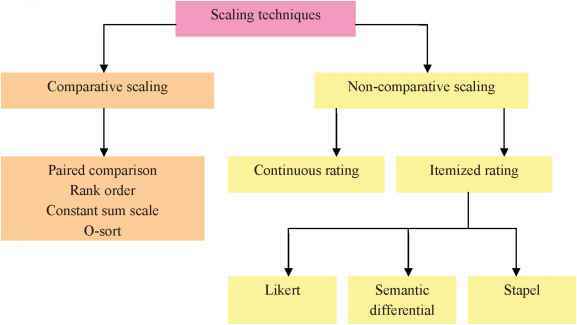 Figure 4.1 provides details relating to the classification of sampling techniques. In the following section we shall discuss each of the sampling techniques. 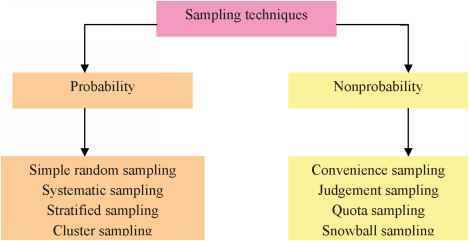 As stated in figure 4.1 probability sampling techniques can be classified into four sub-categories namely; simple random sampling; systematic sampling, stratified sampling and cluster sampling. Simple random sampling is a probability sampling technique wherein each population element is assigned a number and the desired sample is determined by generating random numbers appropriate for the relevant sample size. In simple random sampling, researchers use a table of random numbers, random digit dialling or some other random selection methods that ensures that each sampling unit has a known, equal and nonzero chance of getting selected into the sample. For example, let us assume that the manager of the washing machine Brand X had the name and addressees of all new washing machine buying females (assume the total number is 1000). The manager could create a label associating with each person and put them in a big jar and select washing machine owners from the same. This way each washing machine owner female has an equal, nonzero chance of getting selected. If the number of owners was much larger a random number table can be used however, the chance of each owner getting selected still remains equal and nonzero. In systematic random sampling the sample is chosen by selecting a random starting point and then picking each ith element in succession from the sampling frame. The sampling interval i, is determined by dividing the population size N by the sample size n and rounding to the nearest integer. For example, if there were 10,000 owners of new washing machine and a sample of 100 is to be desired, the sampling interval i is 100. The researcher than selects a number between 1 and 100. If, for example, number 50 is chosen by the researcher, the sample will consists of elements 50, 100, 150, 200, 250 and so on.48 In simple terms, systematic sampling is similar to the simple random sampling however requires that the target population be ordered in some way. Systematic random sample elements can be obtained via various means such as customer list, membership list, taxpayer roll and so on. This technique is frequently used as it is a relative easy way to draw sample while ensuring randomness. One of the drawbacks of this technique is that if a hidden pattern exists in the data the finding may not be truly representative of the target population. However, the potential small loss in overall representativeness is normally countered by significantly larger gains in time, effort and cost.